Bull thistles have earned the title of noxious or invasive in many areas. They are distinguished from all other thistles by the covering of short, sharp prickles on the upper, dark green surface of the leaf blade. It is these prickles that make the surface very harsh to the touch. Like many other plants, the bull thistle grows a rosette in its first year and blooms in its second year of life. Distinguishing Features: The bull thistle is a biennially growing plant. The main stem of this wild edible is firm and thorny. 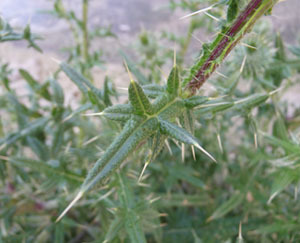 This plant bears leaves that end in extended, very sharp thorns and are beige in colour. This thistle produces a lot of seeds that have small feathers and are fixed to the base by means of a ring until they mature. The roots of this plant are taproots. They are thin and run deep and can develop several smaller lateral roots. Flowers: Bull thistle flower heads are purple and measure 3.5 to 5 cm in diameter, 2.5 to 5 cm long and are usually solitary. There are clusters of them that grow at the ends of shoots and branches. Flowers are subtended by narrow, spine-tipped bracts. Fields of Nutrition has medicinal benefits and vitamin/mineral content of Bull Thistle. Leaves: Bull thistle leaves are alternate, pinnately cut, (lance-shaped) and they have rough, bristly hairs on top and hairy underneath. They can grow anywhere from 7.5 to 30 cm long. Lobes on leaves are tipped with stout spines. Mature leaves grow down the stem beyond their bases, causing the stalk to be ‘winged’ and prickly, lobed leaf-like structures. 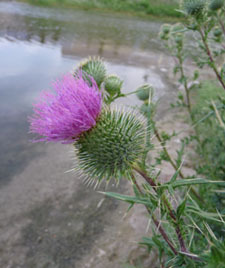 Height: The bull thistle can grow up to 1.5 metres in height. 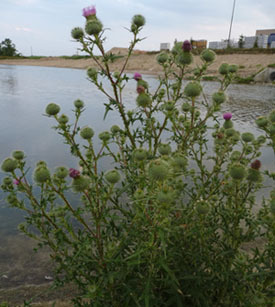 Habitat: Bull thistle is a weed that can grow in a wide range of environments but prefers disturbed areas. It tends to grow best in soils with intermediate moisture although it will grow in dry and wet soils. It likes pastures, edges of woods, waste places, fence lines and roadsides. Its rosettes are occasionally troublesome in lawns and gardens.